Unlike guns, we back our team. No 7&1/2 wrote: I've just said I think england are better than new zealand ld it's what you're complaining about now. See, you are so one eyed it's not even funny. You think England are better than a side they have beaten once in sixteen fixtures, and they beat you in the latest fixture as well, you are deluded. It's not even close 15 wins for New Zealand against 1 win for England. The only time England were better than New Zealand was in 2003. Strange how you think the TMO was right for Steff Evan's try in the 6N even though it has been proven otherwise, yet the same logic does not apply for Underhill's try. I don't think this england side is the same as the one who has played new zealand in the last 16 games. It would pretty stupid of me thinking that! No 7&1/2 wrote: I don't think this england side is the same as the one who has played new zealand in the last 16 games. It would pretty stupid of me thinking that! It's the same side that lost to New Zealand on Saturday. If England were better than New Zealand, they would not have lost. So I think we should just leave it as that. Kick clap! How dare you ebop. Rich coming from a side who gets by kicking points and scoring fewer tries. Sarcasm for the wums. Cool ld. So you agree that the rankings don't reflect how good a side is either then. Don't know why you debate just to agree all the time. Re wales england are we talking about the anscombe disallowed try? My memory is going regarding an evans one. I'll need to look it up. No 7&1/2 wrote: Cool ld. So you agree that the rankings don't reflect how good a side is either then. Don't know why you debate just to agree all the time. Might be Anscombe now you mention it, when the ball came off Evans's leg. What am I agreeing about with you ? Unless you agree, that England are not better than New Zealand ? 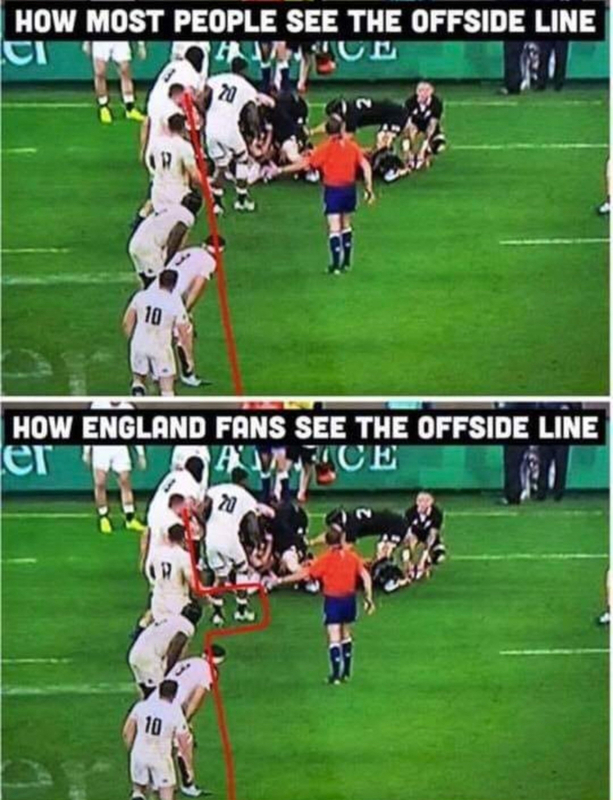 7.5, England play kick/clap-offside rugby. Going 15-0 up early the other day, then what happened? Couldn’t close out a game in appalling weather conditions ‘at home’ from 15-0 up against the best team in the world. What happened? Seems like a choke by England imo. The kind Ireland were renowned for against the ABs. This is all getting a bit weird now. I feel like I've entered a domestic here, you know the one where a couple are going for each other and all you want to do is look at the watch and say "goodness me is that the time, really must go!" Well said Yoda, and with that, I give you, Goodnight. No like I said ld imo england are better. You're just agreeing with me that the rankings don't necessarily tell you which team is better. You're now talking head to head and past matches. That anscombe decision was probably much closer than underhills. I still think wr need to have a set list of things a tmo needs to check when going through any try decision. It seems to random at the moment and too many things not checked that should be. Needs to be more like cricket and rugby league when it's talked through and points checked off. I agree england choked ebop. Better team but blew it. England were not the better team. 15-0 up and then error strewn kick/clap-offside rugby for the rest of the game. England’s dysfunctional lineout and average scrum was monstered by the ABs. The fact England were even in the hunt late in the game was miraculous and they could have pinched an unlikely win. But alas, their constant offside play caught up with them and they deservedly lost a tight game they should have won at 15-0 up at home in appalling conditions. England are ranked about where they are in the pecking order for a reason. ebop wrote: England were not the better team. 15-0 up and then error strewn kick/clap-offside rugby for the rest of the game. England’s dysfunctional lineout and average scrum was monstered by the ABs. The fact England were even in the hunt late in the game was miraculous and they could have pinched an unlikely win. But alas, their constant offside play caught up with them and they deservedly lost a tight game they should have won at 15-0 up at home in appalling conditions. England are ranked about where they are in the pecking order for a reason. 6 losses on the trot, lower ranked, and theyre the better of the two. Gee I hate to see what theyre like when theyre not better. 75-0? Does that make the grade? It’s a running comedy gag that 7.5 has that he thinks England are the best team in the world since Eddie took over but he glosses over losses and WR rankings. It’s pretty funny. You guys are funny. I'm hoping it's deliberate! There was more kick clap rugby from NZ than anyone on Sat. You weren’t watching the game very closely then Guns. The ABs tore through England a number of times and made serious ground but fumbled a final pass or lost possession at an unfortunate stage. Better conditions and those would be points. None of that from England, just kick/clap-offside and errors. ebop wrote: You weren’t watching the game very closely then Guns. The ABs tore through England a number of times and made serious ground but fumbled a final pass or lost possession at an unfortunate stage. Better conditions and those would be points. None of that from England, just kick/clap-offside and errors. Yeah their haul of 1 try was earth shattering. England’s rolling maul try was typically English. The first try was well executed. But then what Guns? Be honest with yourself. ebop wrote: England’s rolling maul try was typically English. The first try was well executed. But then what Guns? Be honest with yourself. Lots of kick and clap from NZ? Oh yeah I forgot it was the weathers fault. Or did you mean the record for the lowest scoring most unconvincing win? Didnt you predict a record score? The ABs kicked a lot early in the game up until they were 15-0 down, probably due to the conditions, but reigned it in when they started scoring points. A lot more were on offer but the ABs fumbled the ball. Ardie especially should have held the ball that he fumbled to race away to score. Never mind. Got the win and deservedly so. England were hanging on up until the last 5 minutes. They played their kick/clap-offside game well enough to limit the ABs in those conditions so good on them. You predicted an England SANZAR slam, lol. If a referee with ballz was reffing the SA/England game they’d be 0-2 right now. Lol. Comedy genius. This may be flight of the concords here! ebop wrote: The ABs kicked a lot early in the game up until they were 15-0 down, probably due to the conditions, but reigned it in when they started scoring points. A lot more were on offer but the ABs fumbled the ball. Ardie especially should have held the ball that he fumbled to race away to score. Never mind. Got the win and deservedly so. England were hanging on up until the last 5 minutes. They played their kick/clap-offside game well enough to limit the ABs in those conditions so good on them. Same can be said of the ref in the game on Sat. I was a Tmo call from the slam being a reality. Good prediction. Yours was shockingly rubbish. What will happen if its raining and the ABs are taking selfies? let them down.Ireland win on Saturday?they`ll need to be much better than v Argentina. Hey you have turned over a new leaf Alan. No complaints about a side relying on the scrum and being outscored by tries. No grumbles about the match being decided by an official. Congrats keep it up. Then that smoke behind them will be the Irish pack on the spit. My prediction was made before I knew the conditions. I got the winners right though didn’t I Guns? Unlike you. You got it wrong. Are you still sitting on the fence over your team’s chances this weekend? Weak weak excuse. Why do you Kiwis love making excuses so much? Are the ABs planning on being really dirty against Ireland again on Saturday I wonder. Collapse2005 wrote: Are the ABs planning on being really dirty against Ireland again on Saturday I wonder. Sure hope so! Id be disappointed if they werent. Pity SOBs not playing too. Hes due a clout or two. Can’t you two just argue via private message rather than using this thread? Getting a bit sad when it was a good game. Just a thought before you both ruin the Ireland NZ thread for the rest of your countrymen? Cyril wrote: Can’t you two just argue via private message rather than using this thread? Getting a bit sad when it was a good game. Why dont you see if you can get some bans going Cyril? Nobody gets banned on here any more, Guns. It’s just posters like yourself slugging it out and trading insults on match threads like this. The mods have pulled up the drawbridge. I dont recall you having a whole lot to offer yourself Cyril. I’m turning over a new leaf, Guns. It’s all getting a bit tiresome. Maybe I’m getting old. Another day where I set off in search of the paradise island of Rugby Discussion, only to have to wade through a swamp full of sh*t to get there. Hoonercat wrote: Another day where I set off in search of the paradise island of Rugby Discussion, only to have to wade through a swamp full of sh*t to get there. Instead of complaining why not contribute something you find interesting and see if anyone responds? I would still say that The All Blacks are the best team but with Irelands strength in depth, the gap is being gradually closed. I would agree with that but I don't have a great feeling about Saturday mainly because of Barnes but also because the performance v Argentina was fairly error strewn. That said in 2015 in Schmidt's first match Ireland were terrible against Australia and then completely put in a barnstorming performance v NZ the next weekend. Hopefully we see the same on Saturday. More likely ld is out of his depth and jumping around conversations again.